Permanent anti-terror measures are to be introduced in Preston city centre to prevent vehicles mounting the pavement. The security features will replace the wooden planters installed along Fishergate in the run-up to Christmas 2017, although no details have yet been released about the design of the new deterrents. The local democracy reporting service understands that the new defences will cover a wider area than the current temporary arrangement, extending along Church Street towards Preston Minister. The original move followed a string of lorry, van and car attacks across Europe, in which a total of 130 people had been killed. 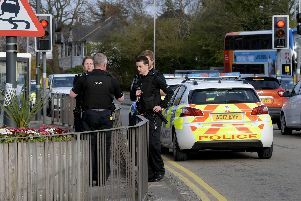 At the time, the authorities in Lancashire stressed that the measure was being taken as a precaution – and not in response to a specific threat. The permanent features will cost £135,000 and are described as “hostile vehicle restraint measures” in papers presented to Lancashire County Council’s cabinet. Members approved the programme as part of the setting of the annual highways maintenance budget, adding an extra £10,000 to the provisional amount agreed at the authoritys full budget last month. The sporadically-placed planters installed 2017 were positioned “so that people on the pavement can get around easily,” cabinet member for highways, Keith Iddon, said as he announced their introduction. The introduction of a shared space scheme in Preston in 2014 minimised the distinction between the road and pavements. It has gradually been broadened beyond Fishergate to incorporate other parts of the city centre.